The apron is used very nicely in this outfit. I’ve never really thought of layering one under anything before. 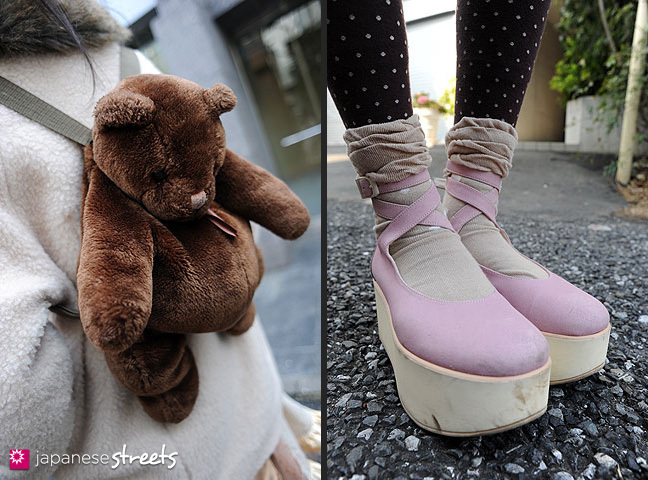 @Irene: Tokyo Bopper actually has some of the coolest shoes in Tokyo. @MaliceInWonderland: It is not visible in my photos, but she also wore a beautiful sheer skirt under the apron. @KD-san: Oooh, a lovely idea. I really like how the ruffles stick out, but it doesn’t look like she’s wearing an apron in the traditional sense. I’d like to try wearing a skirt, apron, and shirt over it to see how it plays out. Your coat is really really very lovely. 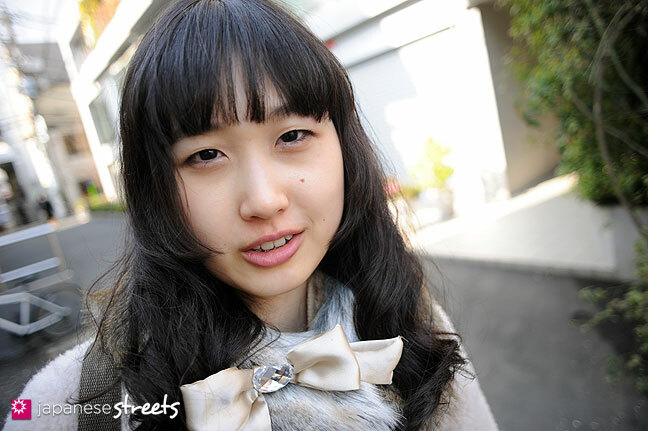 Japanese street fashion is curiously child like! It has an innocence not seen in Europe and very definitely a cuteness about it! @Zoe: Your comment immediately made me wonder about our values for clothing. Where do our assumptions for what is supposed to be appropriate clothing for children and adults originate from? And why do we accept and internalize these assumptions so thoroughly that deviations strike us so strongly? Until the industrial revolution brought us mass production and thereby gave birth to our consumer society, children’s clothing didn’t really exist. Children wore miniature versions of clothing that adults wore. Now we’re starting to experience the opposite, adults are beginning to wear large versions of clothing that used to be considered only for children. Here is an interesting related article about gender typing in clothing: When Did Girls Start Wearing Pink? Her face looks younger, but her eyes show a mature look. The outfit makes me want to go to bed, it looks so comfy ^^U I like the soft colors and textures, and I love the brooch. I would buy one from her! Ha! Another pair of that style of shoe! Now I’m madly on the watch… and what a pretty color, too.